Sailthru helps modern marketers at leading retail and media companies build deeper, longer-lasting relationships with their customers. Sailthru personalizes individual customer experiences across digital communication channels on email, on a brand’s website, and in their mobile applications. Sailthru-powered one to one relationships with consumers helps drive higher revenue, improve customer lifetime value and reduce churn. SaleCycle’s partnership with Sailthru allows mutual clients to benefit from SaleCycle’s expertise in behavioral marketing and Sailthru as an ESP. Together we can work to acquire, grow and retain your customers through providing a truly personalized customer experience across all channels. When users leave our clients website, SaleCycle is able to process their wealth of data learned from the user’s activity on the website to build a bespoke html email personalized towards them. 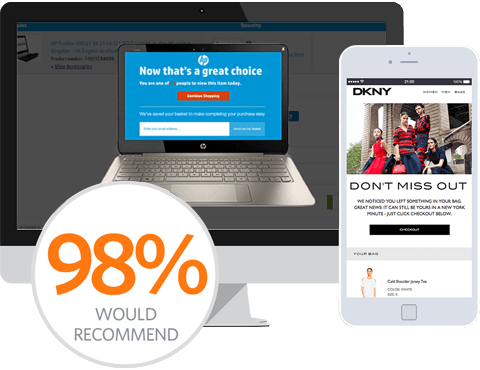 SaleCycle’s messages are dispatched one to one and with our integration, we are able to work in-between all of the client’s other email marketing messages to deliver a smooth customer journey that does not overlap. Delivered through the Sailthru platform, all data is collected and displayed in real-time easy for clients to analyze data via the Sailthru dashboard. Maximize your revenue by dispatching high performance cart abandonment emails through the Sailthru platform. Advanced personalization that helps convert, adding to your complete retention strategy. All your email marketing efforts including SaleCycle can be sent, analyzed and reported on through the Sailthru platform.